We are manufacturers of sprinkler nozzle springs in stainless steel and phosphorous bronze wire and are catering to manufacturers of sprinklers in india. These type of nozzles Rain Gun 11/ 2. Inch are mainly used on yards, golf courses, farms and to provide water to drought lands and vegetation lands as well. 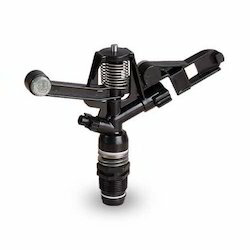 These nozzles can further be utilized to keep the airborne dust at a low level, or as cooling systems and for recreational activities as well. Our skilled team of designers is engaged in providing a wide gamut of Sprinkler Nozzles. Their accurate dimensions, corrosion resistance, seamless finish, high tensile properties and high quality makes these highly reliable and acknowledged across the nation. Additionally, we deliver these at highly reasonable rates. We are engaged in manufacturing and supplying of high quality spike sprinkler with head for our esteemed clients. These are made of high grade raw material which ensures their high quality and durability. We can offer these in customized sizes as per their requirements. - Usage: Agricultural areas, lawn, garden, etc. Ecoaqua Engineering System Pvt. 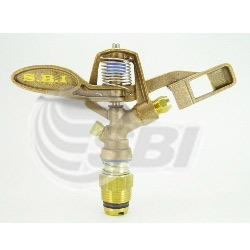 Ltd.
We are offering of Sprinkler Rain Gun Nozzle. application: for supplying water through sprinkler irrigation system. We are the pioneers in the industry for supplying and distributing Sprinklers Nozzle to our revered patrons. We offer them in different sizes and designs and are sturdy in construction. Only after being thoroughly examined on various stringent parameters, our irrigation systems are brought into the market.